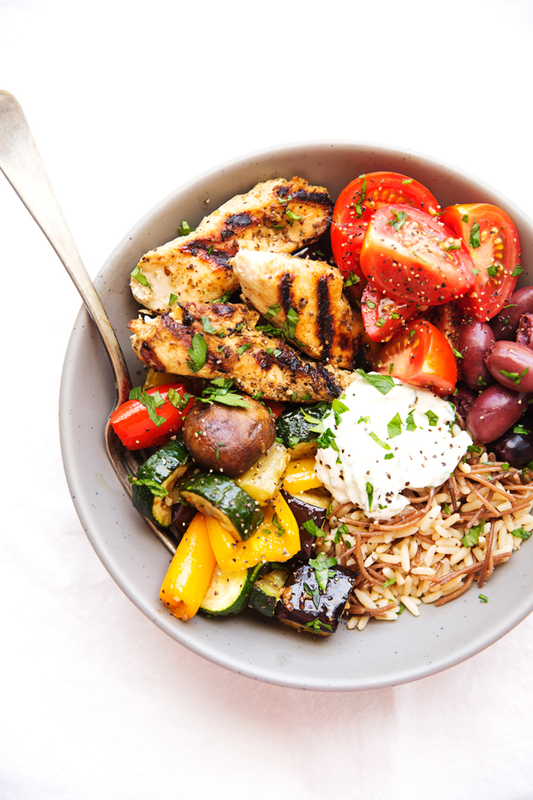 Greek chicken souvlaki bowls! This is a super easy and healthy dinner recipe that’s perfect for meal prepping. I like to roast an array of veggies to go with these chicken kabobs and to top it all of we’ve got homemade tzatziki sauce! I’m on that bowl roll again! 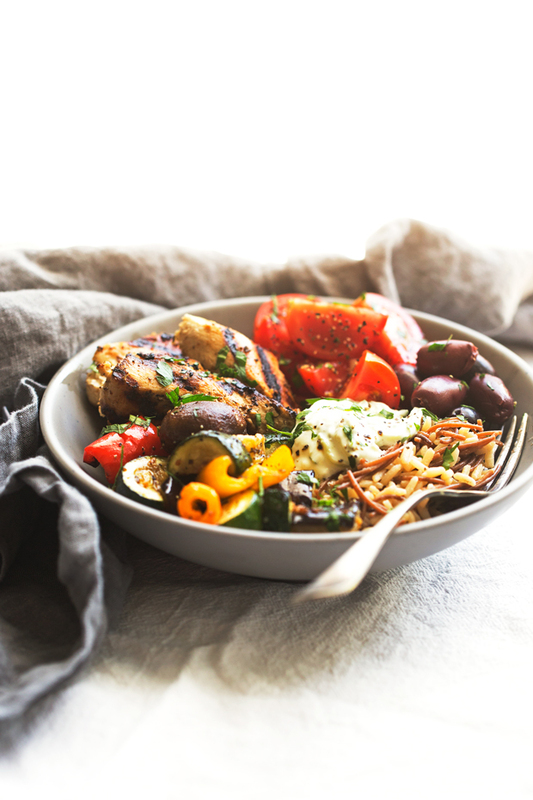 I’m making (and eating) these Chicken Souvlaki Bowl filled with roasted veggies and topping them off with a nice, cooling cucumber tzatziki sauce on repeat. Can’t stop. Won’t stop. And by repeat I mean –> i’m binging on toasty rice pilaf  topped with lemon and garlic marinated chicken tenders that are grilled so they have perfect grill marks on the outside while still being juicy and tenderrrrr on the inside. But it doesn’t stop there, next comes the glorious roasted veggies, like eggplant, baby bella mushrooms, zucchini, and sweet peppers tossed in a hint of olive oil and my go to flavoring — montreal steak seasoning. But — hold the phone — we’ve got a whole other component of flavor to discuss, like this cool cucumber tzatziki sauce made with a hint of fresh grated garlic and protein-packed greek yogurt to top it all off. This my friends is the ideal MEAL PREP meal. Are you itching to get this on the dinner menu for the week? Well what if I told you that this meal is easy to prep and can be done ahead of time so all you really need to do is ASSEMBLE? 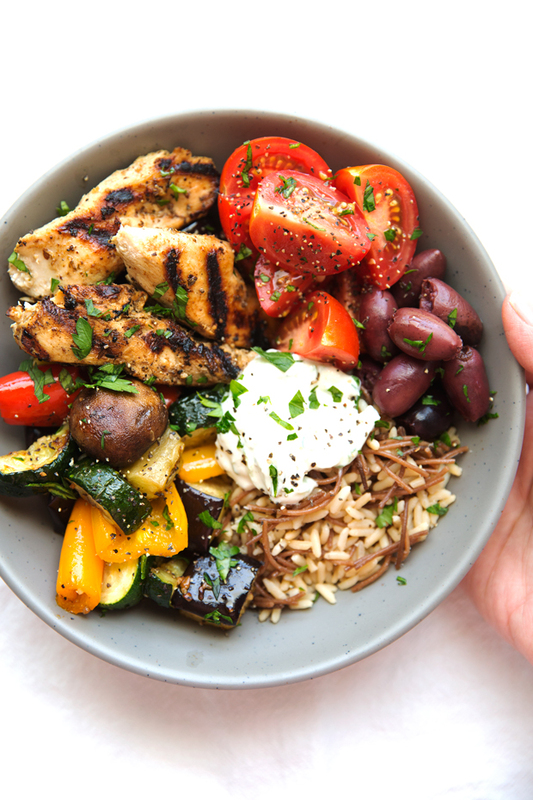 Are you totally feelin’ these greek chicken souvlaki bowls or what? As with a lot of the recipes on the blog, this is meant to be an easy weeknight ‘assembly-only’ sort of dinner. My take on this? 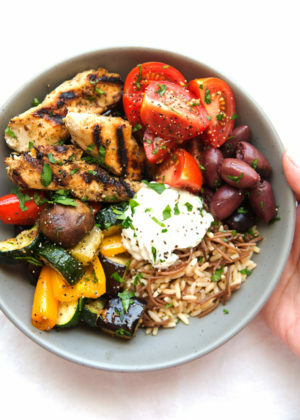 Marinate and prep the chicken over the weekend so that all you really need to do is assemble the chicken souvlaki bowls before you sit down to dinner. You can also roast the veggies ahead of time and not worry about them getting s-mushy as we’ve strategically used power veggies that can withstand a longer roast and still sit through a lengthy refrigeration. And that flavor bomb of a tzatziki sauce! This stuff actually tastes better as the flavors mesh together. Kinda seems to be the theme of todays recipe, huh? I’m telling you, this is the IDEAL #mealprep meal. Other optional shenanigans to consider, chopped fresh plum or grape tomatoes and a handful of kalamata olives because every plate needs a little something fresh on there. Let’s talk about these ridiculously easy roasted vegetables. Okay, so this has literally been my go to seasoning for roasted vegetables from the moment I set foot in a kitchen to cook for the very first time ever. No joke. It’s so good that i’ve got my mom and my sister hooked on it too. And yes, we’re talking about this seasoning , in case you were confused. And yes, as in actual STEAK seasoning. While i’ve got your attention, let me also mention that this chicken souvlaki marinade consists of 4 ingredients other than salt and pepper. It’s a 1/4 cup of lemon juice, a little olive oil, grated garlic, and oregano. I know that doesn’t seem like it would be POW, in-your-face flavor but trust me on this, the longer you let the chicken marinate, the more flavoful it will be. And friends, this doesn’t have to be limited to chicken souvlaki BOWLS. And here, let me give you something to really judge me about, I am totally not above tossing these grilled chicken souvlaki tenders into flatbread  and serving it with chopped lettuce and tzatziki on the side for a build-your-own-wrap kind of meal. Can we just start making Flatbread Friday a thing? And if that wasn’t bad enough, I may even dice and roast some potatoes with that steak seasoning and shove them into my wraps. CHICKEN:Combine all the ingredients except the chicken in a bowl. Place the chicken in a zip-top bag and pour the marinade over the chicken. Seal the bag and massage to evenly distribute. Allow the chicken to marinate for 20 minutes and up to 14 hours. Keep in mind, the longer you marinate, the more flavorful the chicken will be. When ready to cook, heat an indoor or outdoor grill, you can skewer the chicken if cooking on an outdoor grill to make it a little easier. Cook the chicken for about 1-2 minutes per side, about 4-5 minutes total or until the chicken is cooked through. VEGGIES: Preheat the oven to 425ºF. 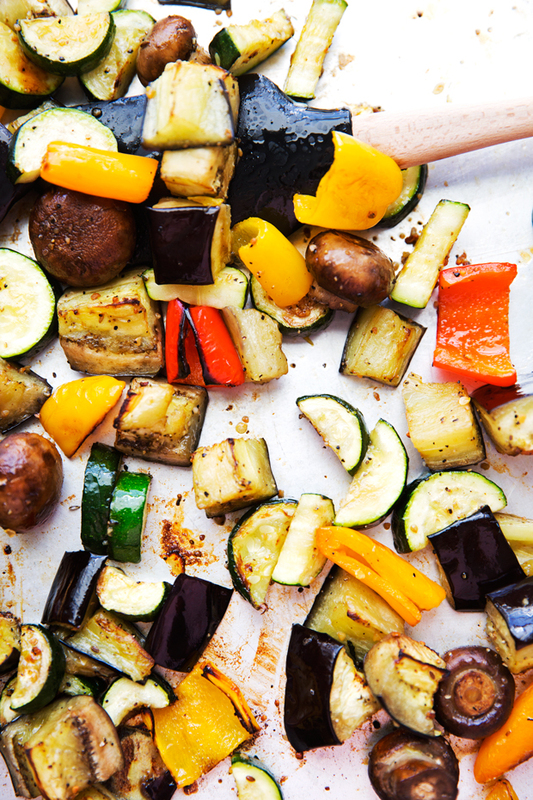 On a large, rimmed baking sheet, toss the veggies with the olive oil then sprinkle with the seasoning. Spread the veggies so they are in an even layer. Roast for 10-12 minutes, flipping halfway through. TZATZIKI SAUCE: Combine the yogurt, garlic, vinegar, salt and pepper in a bowl with a whisk. Add the grated cucumber and stir with a spoon until mixed. 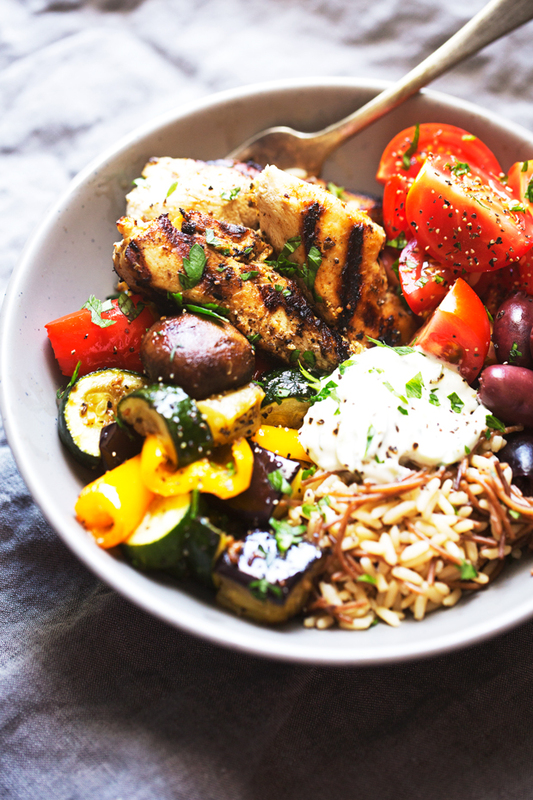 ASSEMBLE: Place rice or quinoa in a bowl, top with cooked chicken, roasted veggies, chopped tomatoes, kalamata olives, and drizzle the tzatziki on top. If meal prepping, keep the sauce and fresh veggies separate so it’s easy to reheat the bowl. You can use boneless skinless chicken tenders that are white or dark meat for this recipe. Other veggies that are delicious when roasted — broccoli, cauliflower, and carrots. You can use sweet potatoes, red potatoes, or even cubed butternut squash but keep in mind that it will take much longer to roast these. Consider roasting them on a separate baking sheet.